Tomatoes are a fairly easy crop to grow, so it is distressing when your plant is not healthy. Leaves that turn yellow are nature's way of telling you something is amiss. While the cause may be something as simple as not enough water, it is more likely a fungus, virus or insect that is affecting your plant. 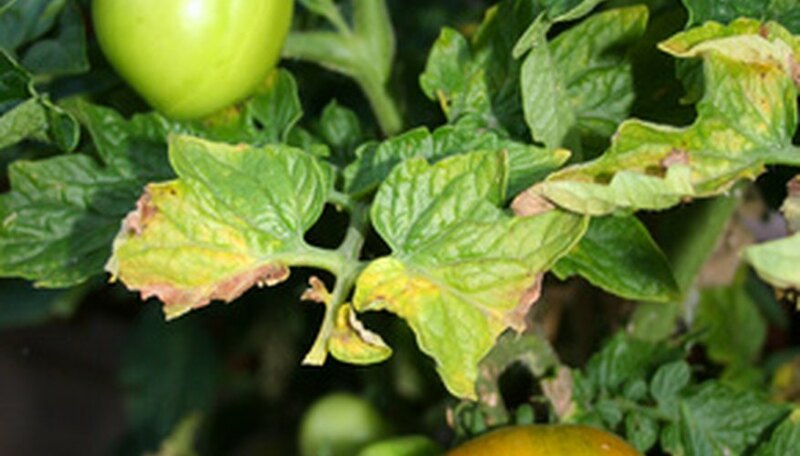 Several types of leaf spot can affect tomatoes, but the septoria leaf spot will turn the vegetable plant's leaves yellow. Texas A&M University Extension suggests controlling the fungus by spraying with a combination of chlorothalonil and benomyl (Benlate). As soon as symptoms appear, apply chlorothalonil every seven to 10 days, then also spray with benomyl every other spray (14 to 20 days). High humidity and excessive rain or dew cause wet foliage, leading to infestation. If your tomato plants are stunted, their roots have knots (galls) and the foliage is pale yellow, they are most likely infested with root knot nematodes. The galls caused by the nematodes keep the roots from sending nutrients up to the foliage, which causes the stunting and yellowing. Control the nematodes in the soil by planting marigolds three months before fall's first killing frost and then planting cereal rye as a winter cover crop in your garden, Texas A&M recommends. Some varieties, such as Better Boy, Celebrity and Small Fry, are resistant. The letter N after the tomato's name on the label indicates nematode resistance. The beet leafhopper transmits the curly top virus, infecting tomatoes, beets, peppers, cucurbits and other vegetables. The virus causes curled, thick and yellowed leaves with purple veins, along with stunted growth and fruit deformation. New Mexico State University College of Agriculture recommends controlling the disease by removing weeds from near the garden, destroying infected plants (do not compost) and placing a netted cage over young plants to keep the insects away. Older tomato leaves that turn yellow and droop may be a sign of fusarium wilt . The fungus Fusarium oxysporum lives in the tomato's vascular system, which affects delivery of water to the leaves. To diagnose fusarium wilt, Colorado State University Extension suggests cutting open the plant's lower or main stem and looking for dark brown discoloration. When choosing a tomato variety, pick one labeled with the letter F on the label, which means it is resistant to fusarium wilt. The fungus can remain in the garden for up to three years, so crop rotation is important if there's been an infection. No fungicides are available to control this disease.